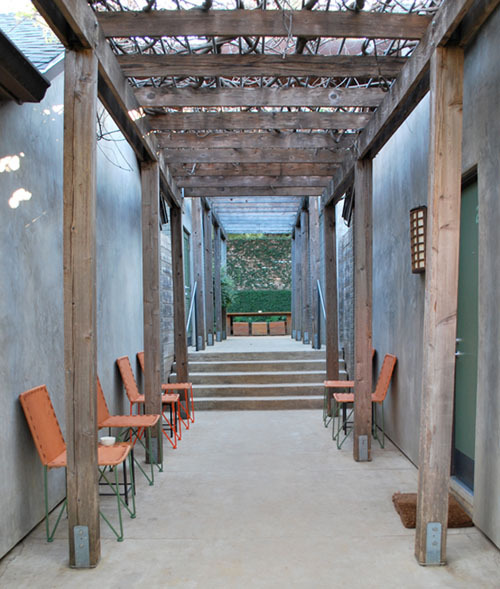 Based in Marfa, Texas, the pair have a knack for photography and design...and knowing which pieces are worth salvaging and recovering. Like this piece they fully restored- the Eames rocker in solid black. 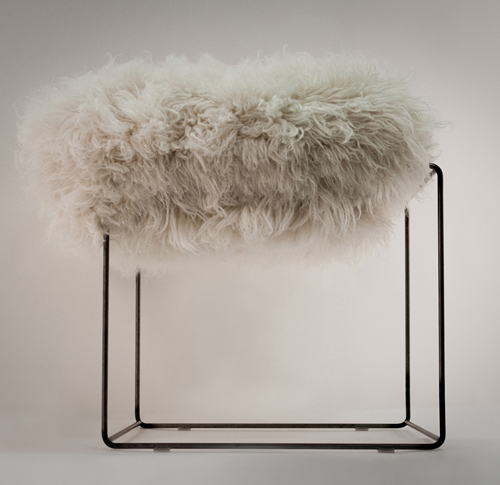 See the entirety of their ever evolving Cast & Crew shop, which always includes stunning chairs and taxidermy deers with hand dipped antlers, here. 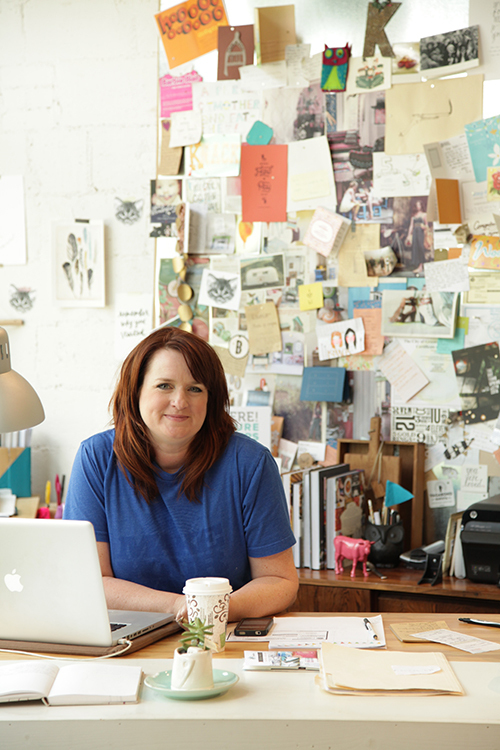 A fan of Haskell Harris, I follow her wonderful southern inspired blog, Magpie. 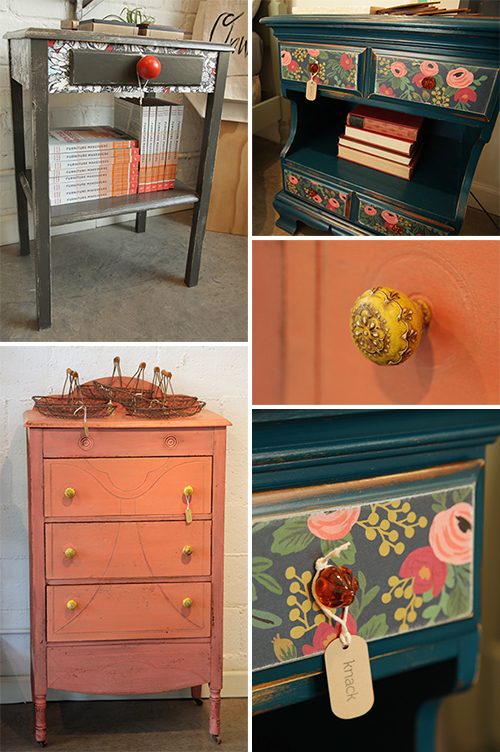 And it was here that I found her gushing review of Tricia's Treasures in Birmingham, Alabama. As I was planning to visit there a week after I read the post, I bookmarked it- knowing I had to see this much hyped antique shop for myself. As the pictures reveal, this place is a treasure trove. 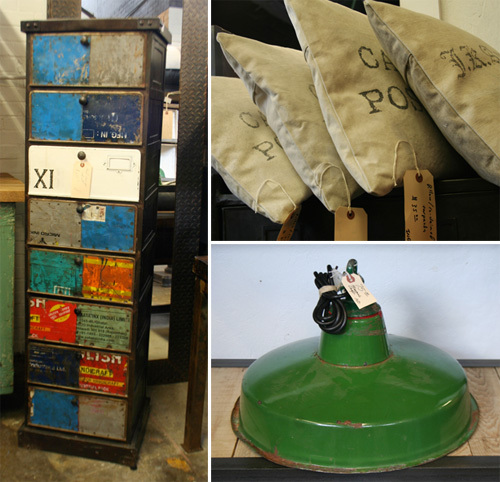 With over 20,000 square feet of inventory, it's packed with incredible finds- row after row, stack after stack. 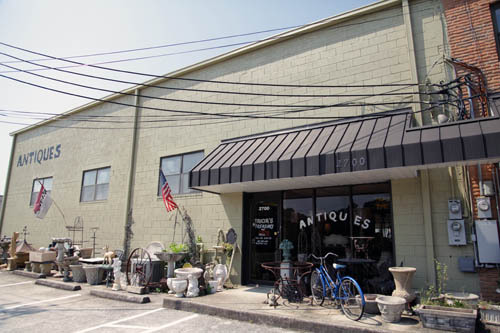 Owner, Tricia Thomas has been in the antiques business for 31 years. As her parents owned an antique shop, she learned the business early on and found a love in hunting for treasure. Tricia, "I love to buy things that I think people will love as I'm always thinking of who may like something. I buy all kinds of styles too because people have lots of different tastes." 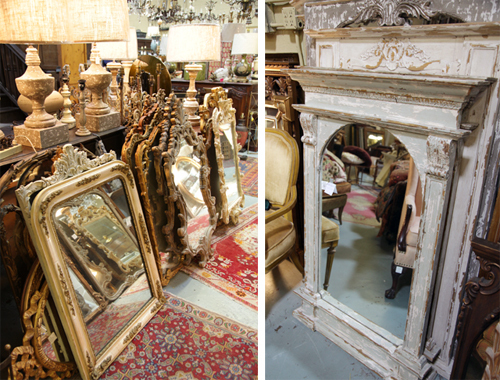 One thing that Tricia's Treasures is known for is its incredible selection of mirrors. They have hundreds of them, priced from $150-$3000. I brought along my good friend, Bradley Odom, who is the Director of Design Education for West Elm. I liked following him around with my camera as he oohed and aahed over this or that. 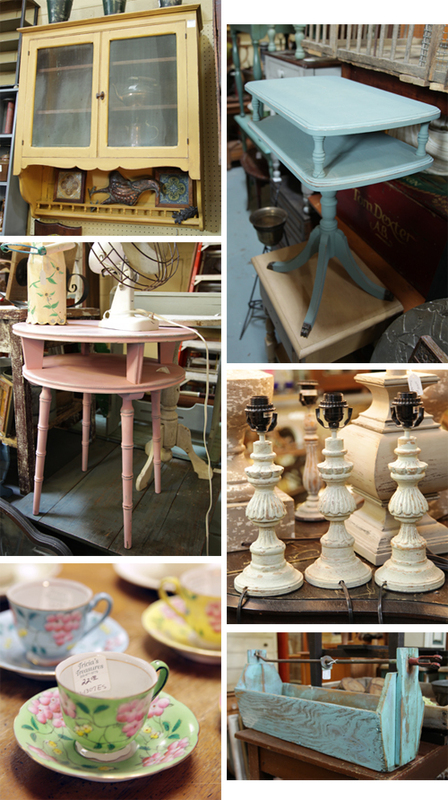 There were just so many great finds- and good prices too. 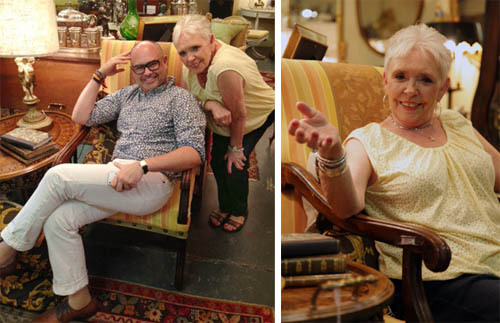 Home decor shops come and go but Tricia's Treasures has become a bit of an institution in Birmingham. Everyone knows the name and there is a constant flow of customers and designers in and out the front door. Tricia is succesful because she buys various styles and price points, plus she has an incredible eye for what will sell. Tricia, "I'm not a trendy person but I have a few trendy things you'll find too." I think the best part about Tricia's is the southern hospitality. Her, along with a colorful staff, can be found just a few feet inside the front door. They all say hello and ask lots of questions - Where are you from? What are you looking for? Where did you buy your cute shoes?... There's a lot of great finds here but I like to think Tricia is the biggest treasure of all. Go visit...you'll love every moment of it. Christopher White is an impressive guy. As a junior Marketing major at the University of Georgia in Athens, he's already created an eye catching line of home decor pieces that are as stylish as they are distinctive. 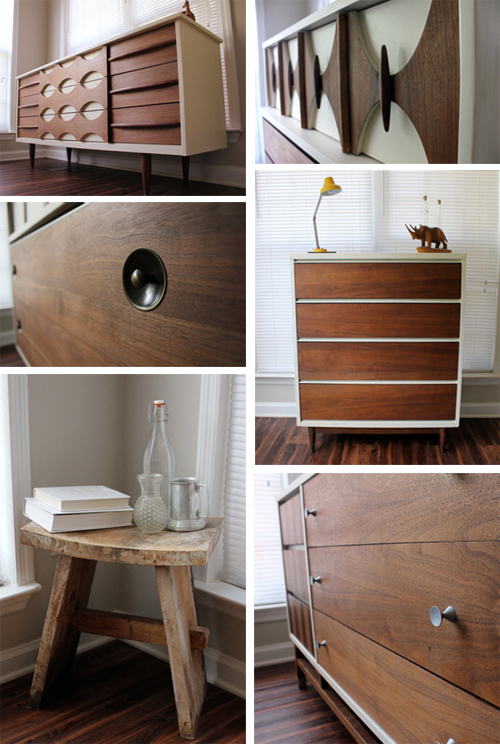 Utilizing worn and weathered mid century furniture, Christopher gives the pieces he finds a much needed face lift. Adding bone white paint to contrast with the typical shades of brown found in mid century furniture, Christopher creates upcycled home decor pieces that have a unique look and feel. 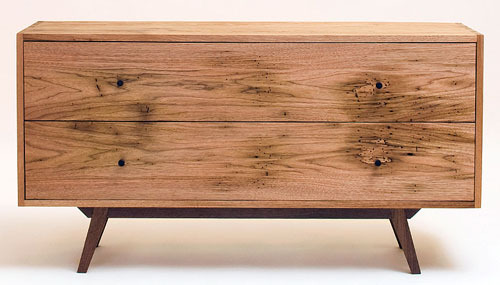 As he shares, "During restoration, I like to infuse my own style within the detail of each piece." See all of Christopher's creations here...and bookmark it. He's a designer to watch. 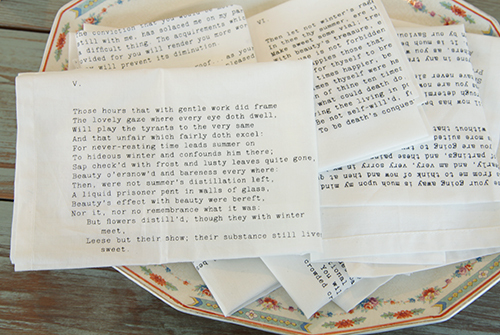 A story teller at heart, I love any handmade piece with a tale to tell. Which is why I'd have a lot of fun hanging out at the workshop of born and bred southerners, Michael Moran and Celia Gibson. 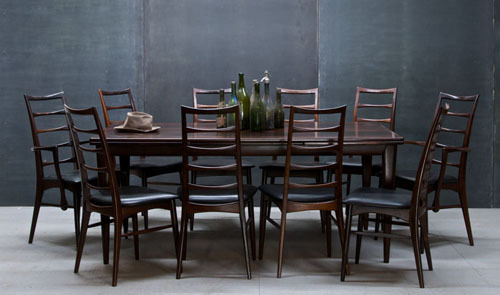 Based in Charleston, South Carolina, Michael and Celia use great care, patience and skill to craft stunning pieces of furniture. They both care deeply about the natural world and work with a sustainable mindset. 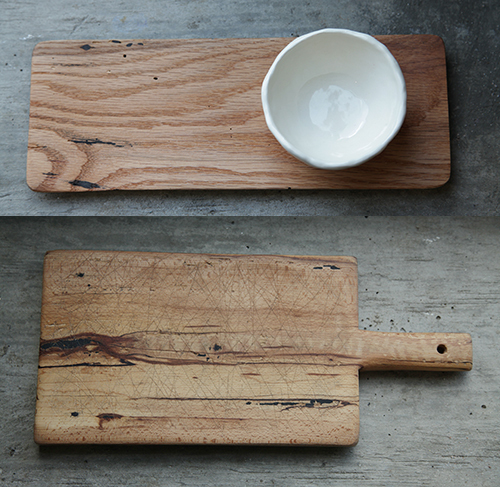 As stated on their site, "We are interested in the interaction of the natural and handmade worlds. We work to discover where these worlds intersect and how they can complement and balance each other." Michael is the accomplished craftsman of the pair while Celia handles much of the business side of things, yet together they design each piece. Looking through their gallery, they can create just about anything, but specialize in cabinetry, tables, benches and chairs. 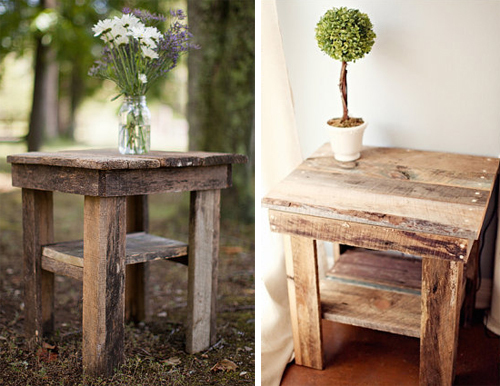 Every tree, has a story to tell as evidenced in the two pieces above that vary greatly in look and feel. Working in an organic way, Michael and Celia allow the natural characteristics of each tree to dictate the direction of the design. As Celia shared with me, "We hope these objects offer a sense of the origin of things, of the calm, quiet physicality of the world of a tree." 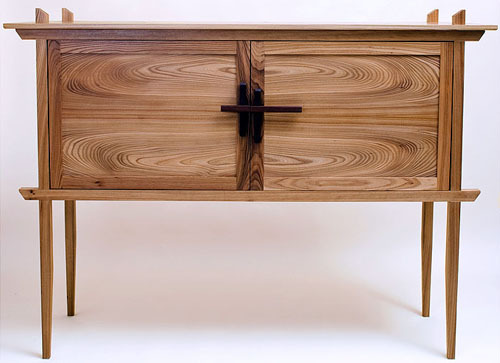 Michael and Celia believe in what they refer to as Good Wood- or wood that "comes from family run mills where sustainability and ecological soundess are essential values." 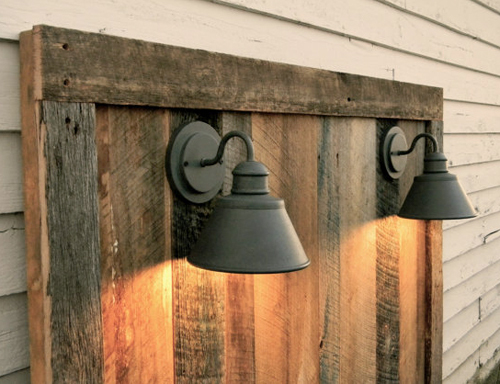 They salvage recycled wood as well as take advantage of downed trees. 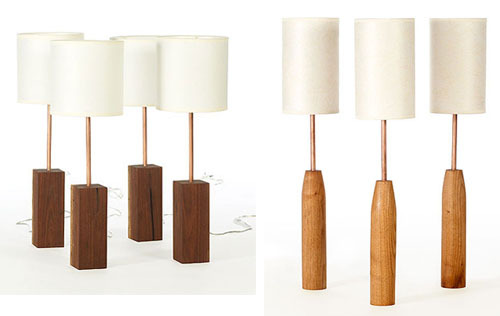 See their salvaged cherry candlesticks, made exclusively for Garden & Gun, here. 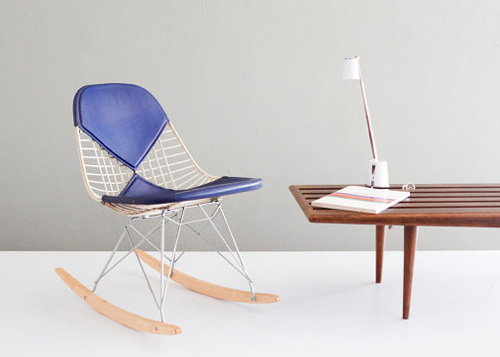 If you like to pass time perusing furniture sites, then you need to bookmark Modern 50. 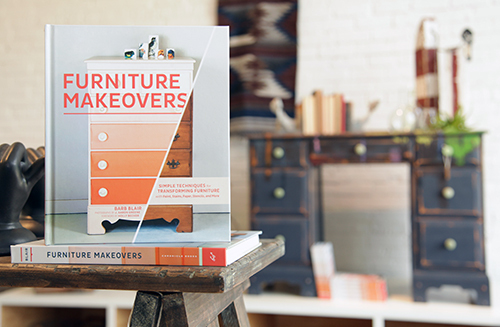 They curate and assemble incredible furnishings for both retail and the tv/film industry. 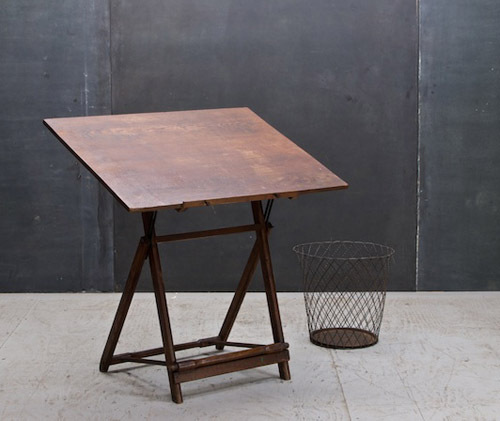 This incredible mercantile desk is circa the 1890's, made of oak and built to last. 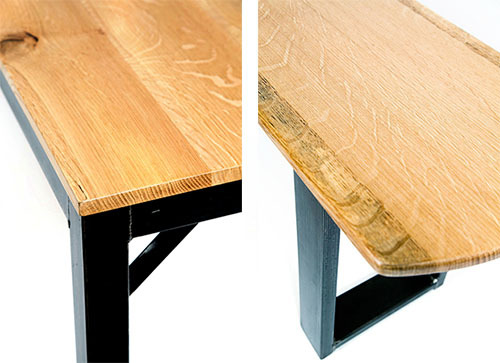 The wear and tear over the last century shows...and that's a good thing. I was going to showcase a cross section of their wares but I couldn't get past the first category on their list, Tables and Desks. They're all such amazing pieces ranging in age, origin, condition and purpose. If you have a specific vintage piece in mind, chances are they have it...or can find it. 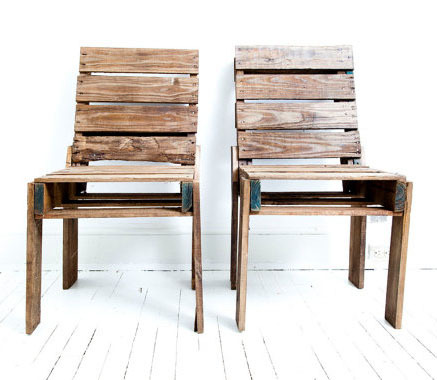 Based in Paint Branch, Maryland, the creatives behind Modern 50 have a knack for finding amazing pieces, all with an industrial, salvaged or mid century feel. 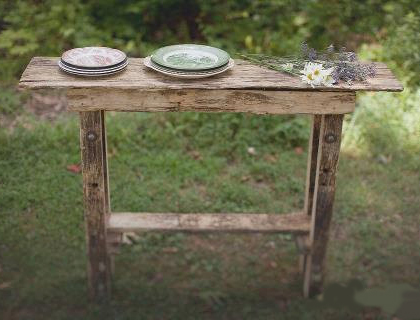 If I had to make a speech, I'd prefer to make it behind this 1930's vintage podium table. And I would very much like someone to buy me this Greenwich Slate Industrial Bar Cart. 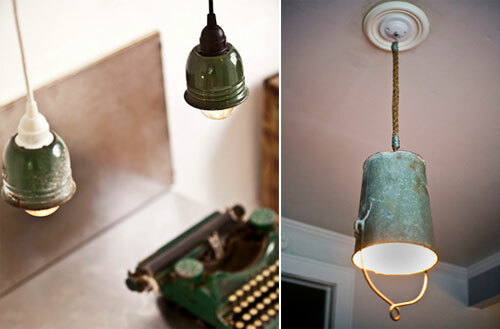 It's from the 1930's and the worn green patina on the salvaged steel frame is a bit dreamy, don't you think? 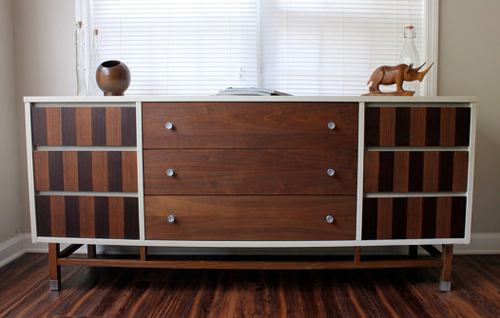 See all of Modern 50's beautifully curated or created finds here. On my last few visits to the fabulous Kudzu Antiques in Decatur, Georgia, I've found a new booth to admire. When you walk inside, turn right and it's the booth in the far left corner. 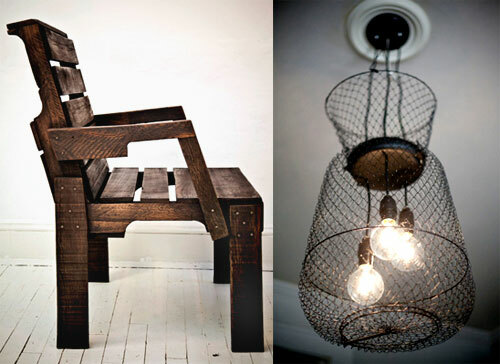 You can spot it easily- big, oversize pieces made of wood, steel and reclaimed items. The colors are dark and rich and there is all sorts of masculine energy running amok here. The artist is Christopher Bailey from Panama City Beach, Florida. 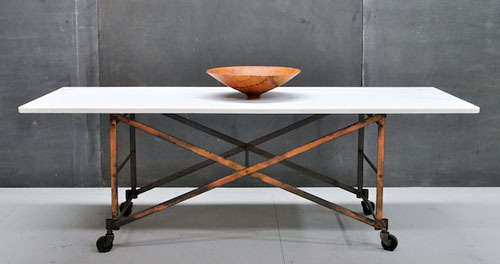 His wares, which he calls Industrial Chic, are solid and durable, made from steel, cast iron, reclaimed aged wood, rivets and mechanical elements. 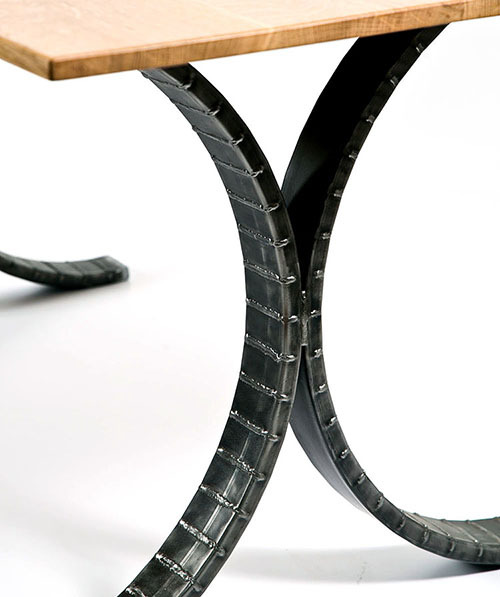 This steel riveted console has man cave written all over it. 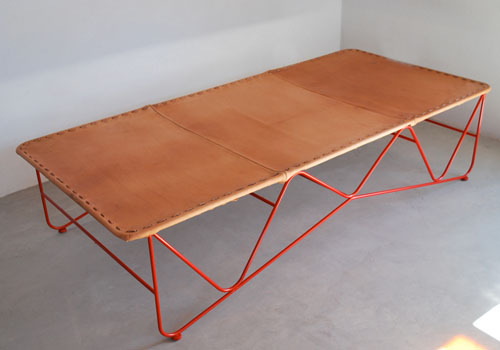 It's a great piece to add to almost any manly abode... You can work on your laptop with a cup of joe or kick back with a bourbon and some friends after work. Just need to balance this piece out with some lighter, softer elements in the room. 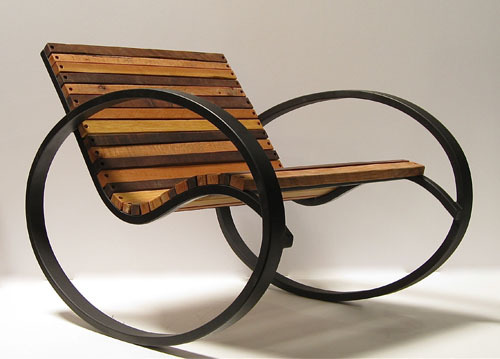 Chris began repurposing industrial elements into furniture back in 1997. I like the fact that he's attracted to large pieces with big wheels, pulleys, rivets and weighty materials. 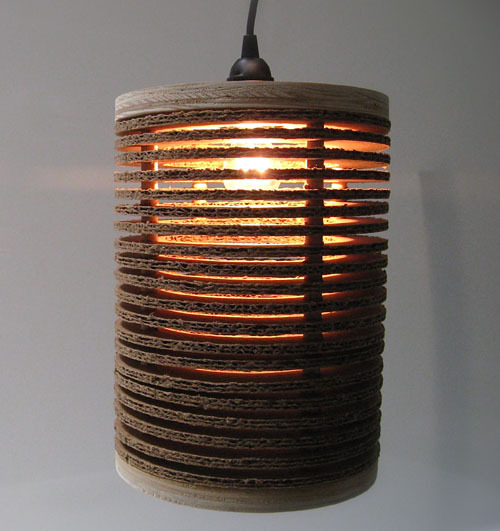 It makes his work easily identifiable and really fun to incorporate into a room or office. This kitchen island is a stunning piece, made from reclaimed bowling alley floors. 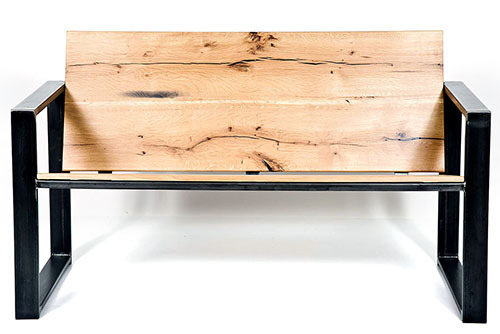 If you have the space, and the extra $685, this would make quite the visual impact. 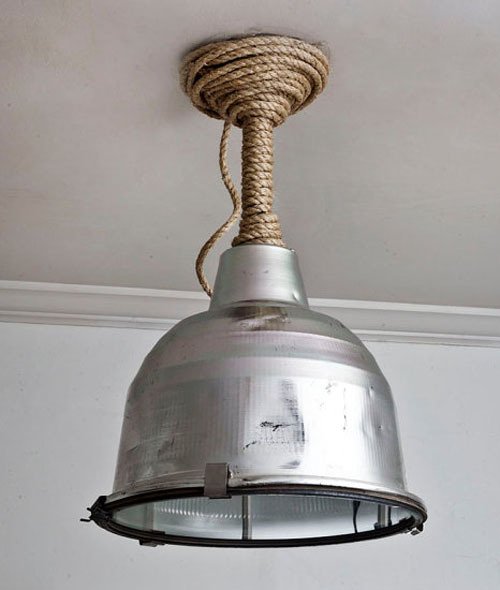 I'm also really admiring this New Orleans pendant, priced well at $139. Perhaps his most eye catching works are the array of large storage cabinets he has designed and built. These would work so well in a large office space, eliminating ugly file cabinets with banal, corporate personalities. Featured here is the industrial French tailor's bin and a rustic galvanized steel finished bin cabinet with a steel frame.